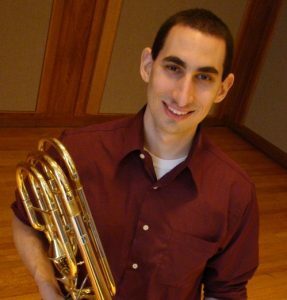 As an orchestral bass trombonist, chamber musician, and teaching artist, Philip Hyman enjoys a varied musical career. Mr. Hyman can regularly be heard playing with the Glens Falls Symphony, Boston Ballet, and Back Bay Chorale. He has also performed with the Boston Pops, Boston Modern Orchestra Project, New World Symphony, Rhode Island Philharmonic, Vermont Symphony, and Hartford Symphony. He has worked with world-renowned conductors such as Michael Stern, Peter Oundjian, David Zinman, James Conlon, and Michael Tilson Thomas. As a founding member of the Redline Brass Quintet, Mr. Hyman has helped commission and premiere several new works for brass quintet. The group also works closely with outreach programs such as the Boston Philharmonic’s Crescendo! program to bring interactive performances into inner city schools.